This computer-enhanced image previews the 4C, a concept that hints at a rear-engine, rear-wheel-drive Alfa Romeo coupe to debut Tuesday at the Geneva show. Fiat's struggling sporty brand is to start production of the 4C in late 2012. TURIN – Alfa Romeo took design cues from the legendary 33 Stradale when creating its 4C concept car, company sources say. The concept, which hints at a two-seat, rear-engine, rear-wheel-drive coupe that would become the brand's halo car, will be unveiled Tuesday at the Geneva auto show. Automotive News Europe has been given a computer-enhanced image of the car from the Italian car magazine Quattroruote. Sources close to Fiat tell ANE that the rendering closely matches what will be seen on the Alfa's stand on Tuesday. The 4C concept was designed by the Fiat Group subsidiary's styling center in Turin. The car is rakish, very compact and extremely low to the ground. The concept debuting in Geneva takes some design clues from the 8C Competizione, but its main inspiration is the limited-edition 33 Stradale. 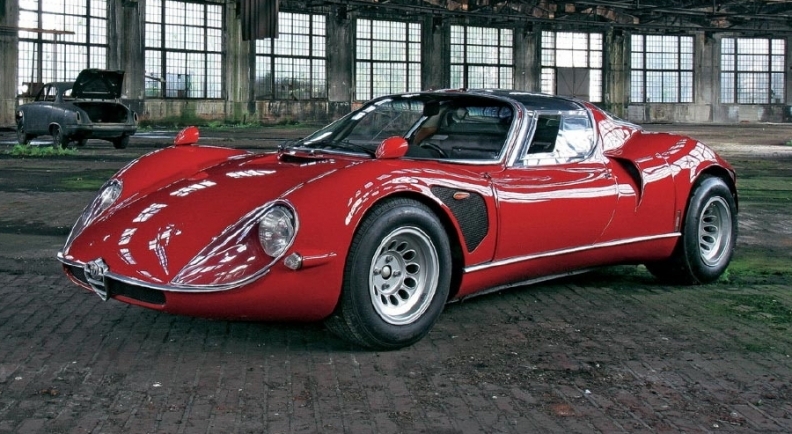 Launched in 1967, the 33 Stradale was a rear-engine, rear-drive two-seat coupe powered by a 230hp 2.0-liter V-8 derived from Alfa's 33 racecar. Alfa built just 18 units of the 33 Stradale, which immediately became a collector's item due to its performance characteristics as well as its cutting-edge look created by Franco Scaglione, one of Italy's top independent designers in the 1960s. 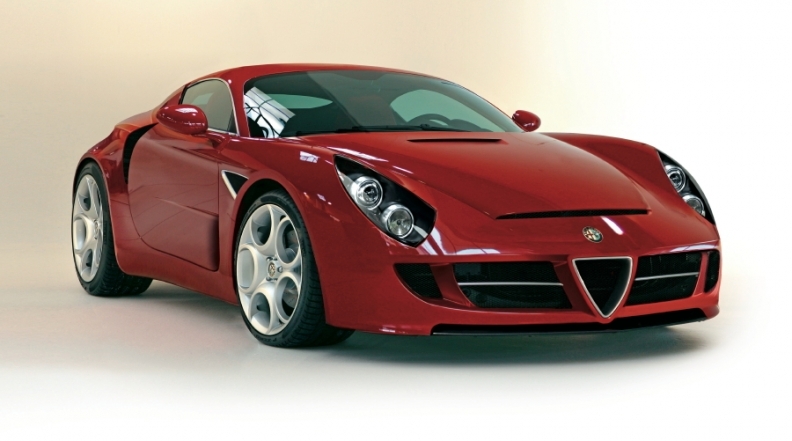 The 4C concept takes design cues from one of Alfa's most beloved models, the 33 Stradale (shown). Launched in 1967, Alfa built just 18 units of the car, which immediately became a collector's item. Fiat's struggling sporty brand is set to launch production of the 4C at the end of next year priced at about 45,000 euros (about $62,000) in Europe. Alfa is set to begin production of the 4C by the end of 2012 in one of Fiat's factories in Italy, possibly at its Mirafiori plant in Turin. The automaker plans to build 15,000 to 20,000 units of the 4C coupe over five years, two people familiar to the matter told ANE. Another 5,000 to 10,000 units of a roadster version of the 4C will be built for Abarth, the sources said. Abarth is Fiat's sporty subbrand that markets high-performance versions of the Fiat 500 minicar and Punto Evo subcompact. The Fiat sources said that the 4C could be sold in the United States, but no decision has been made yet. The 4C will go on sale at a crucial time for Alfa, as in the final quarter of 2012 the company also plans to introduce the Giulia mid-sized sedan to replace the slow-selling 159 and the brand's first ever SUV, a sister model to the Jeep Compass/Patriot replacement. The 4C should attract customers to Alfa showrooms to discover – and hopefully buy – the Giulia and the SUV, two key models in Fiat S.p.A. CEO Sergio Marchionne's plan to lift Alfa sales to 500,000 units by 2014. Alfa's global sales last year increased a modest 10.2 percent to 112,000 units despite the introduction of the Giulietta compact hatchback. Thanks to an innovative construction method, which combines carbon fiber and aluminum, the 4C will be very lightweight. Alfa is targeting an 850kg (1,784 pound) curb weight for the car. At that weight, the 4C would have an impressive power-to-weight ratio below 3.5kg/hp despite being powered by the 1.8-liter, four-cylinder gasoline direct-injection engine offered in the Giulietta with the horsepower boosted to more than 250 hp from 235 hp. Alfa Romeo teamed up with Italy's Dallara Automobili, which is one of the world's largest producer of racecars to create the 4C. The car's structure is inspired to the X-Bow, an extreme two-seat roadster launched in 2007 and engineered by Dallara for Austrian motorcycle maker KTM. Dallara developed a new carbon fiber cockpit for the 4C, radically different from the unit with now doors and very high rockers made for the X-Bow. The 4C's carbon fiber cockpit features front and rear aluminum sub-frames to house the engine and carry the suspensions, as well as dedicated portions designed to absorb deformation in crash tests. GTA is Alfa's acronym for Gran Turismo Alleggerita – Lightened Grand Touring in Italian – and was last used for the 147 GTA compact hatchback.